As long as I’ve been alive to remember, not a whole lot has ever happened in my hometown of Vista, New York. Back when I was ten years old there was a big to-do when an Associated supermarket sprang up in our sole strip mall, but they shut their doors just a few years after it opened because our town’s demand for groceries was too small to keep a full-size supermarket in business. There was an Italian restaurant along a little pond behind the strip mall which couldn’t lure enough customers as it couldn’t be seen from the road, so it closed and a new manager set up a new Italian restaurant – which quickly went out of business, and that was replaced by a third Italian restaurant – which also went out of business. For a couple of years Vista boasted a carpet store – which just as soon as it opened up went out of business, and of all things a used sporting goods store – which lasted maybe six months before it too went bankrupt. The only real economic development that I can think of over my 22 years of knowing Vista is when the shopping center sprouted a shop for beers by the caseload and keg and a merchant of wines and hard liquors – to my understanding these businesses are thriving. Vista is such a peripheral enclave of Westchester County in that we are too small to justify our own infrastructure – we have no train station, no library, not even a post office of our own, and still we are too far from the larger suburbs of Mt. Kisco, Bedford Hills or Katonah to make use of theirs. Until the Katonah-Lewisboro School District was carved out in the 1950s, Vista residents went to school in Connecticut. 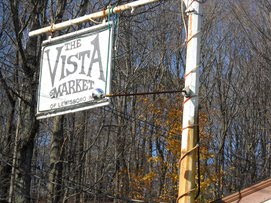 You see, Vista is so far from the larger suburbs of New York that for many practical purposes Vista residents had to leech off of the state next door. By the time cell phones became widely used in the late 1990s and 2000s, Verizon and Nextel built cell towers in all of the New York suburbs and all of the Connecticut suburbs, but Vista was so far between both that it couldn’t get reception from either. Vista is so distant and relatively isolated that if its residents wanted to be able to use cell phones anywhere within the 533 neighborhood code, the hamlet would have to built a cell tower of its own. The lack of cell phone coverage in my bucolic hometown is quite a serious matter. All of the landline phones in my parents’ house are wireless, so when the power went out we had no functioning phone at all – though we would if our cell phones could find a signal. When an ice storm this past month turned our vital artery Rt. 123 into miles of bumper-to-bumper traffic, none of the commuters trapped in their cars could communicate with the outside world to tell them to avoid the road. Once when I was 16 years old I was pulling out of a parking lot and another driver raced around a blind corner and crashed into my side and my car spun out in a 720 degree turn until it plowed into a snow bank – though we both had cell phones, neither I nor the other driver could call out for help and we had to wait for someone to physically drive to the Fire Department to call in a police officer from their two-way radio. Especially for emergency situations, public safety in Vista is endangered by the lack of reliable communication infrastructure which exists just about everywhere else in the populated territory of the United States. Though the mantle of science and reason hasn’t stopped the Sheila Broflovsky’s of Vista from holding up progress. Even though the medical fallacy is gaining less traction, the voices of reaction now put up claims that a cell tower conflicts with “the wooded landscape and the rural character of the town”; in so many words, we can’t have modern technology which is all but necessary to do business and simply function in the world nowadays because some people are under the delusion that their suburb of the New York metropolitan area is in fact a clearing of log cabins in the Adirondacks. “You know, one of my patients suffers from panic attacks every time she sees an Asian man in a pickup truck - maybe society should accomodate her phobia with a town ordinance prohibiting Asian men from driving pickups?" When I’m sitting in my little Minianka village in the Malian bush and my parents call my Nokia cell phone via Skype, I find it hard to believe that the villagers of Vista are still debating about this. I find it even harder to believe that educated Americans in the year 2010 can be so terrified of technology that they don’t quite understand, and that their unfound fears are strong enough of a political force to prevent such unarguably necessary development. And I find it absolutely humiliating that I live in a village of mud huts and millet stalks with no electricity, no running water, no trash collection and no dirt trail worthy of the word “road” – but I have 5 bars of cell coverage 24 hours a day 7 days a week, and my parents in Vista, New York can’t even receive my text messages because my hometown has been for so many years too pigheaded to put up a cell tower. My Minianka tribesmen neighbors are afraid of lots of things - they believe in witches and wizards and black magic, they are scared of frogs, goblins and demons I which supposedly wander the fields at night. But unlike the villagers of Vista, they aren't scared of cell phone towers. The people here are proud of their cell phone tower which dominates the skyline of one-story huts - to them it symbolizes progress and modernity, it demonstrates that their otherwise backwater village matters enough to have a place on the map. The chief of my village is an old illiterate, toothless man named Abdoulaye Sogoba. He doesn't have a phone himself, but he still understands the value the service has for the rest of his neighbors and their market. In conversation, Abdoulaye let me understand how important is the cell tower of Sanadougou. "Nowadays, phones are necessary to do business! No one can do any serious business without one!" "But what about back in the days before Sanadougou had a tower built? Aren't you sad about the traditional way of life that is now lost?" "Nothing has been lost! This change is only good for us! The time of not being able to speak with other villages is a thing of the past, it is time to move on." "What about all of those other little villages that don't have cell towers? What do you think about them?" "I feel pity for any village without a cell tower. Without a cell tower, the people cannot experience any development."